Saturday, June 2, 8:30 am to 4:00 pm. Each year since 1993, the Martha's Vineyard Land Bank Commission observes National Trails Day – the first Saturday of June – by conducting a day-long hike across the island to expose people to the network of trails that connect the island’s many conservation lands and public properties. For more information, see the MVLB website. Thursday, June 7, 10:00 am, at the Polly Hill Arboretum. Join PHA Director, Tim Boland, on a talk and walk through the Polly Hill Magnolia collections. As a special bonus, there will be a raffle for a big leaf Magnolia collected in the wild by Tim on one of his plant collecting expeditions! $5/free for PHA members. For more information, see website. Saturday, June 9, 9:00 to 10:00 am, State Beach, OB/Edg. Walk the beach with a Felix Neck shorebird biologist to record field data, search for birds and nests, and identify bird and mammal tracks in the sand. Meet at the State Beach access trail on the Oak Bluffs side of Big Bridge. All ages, FREE, no registration req'd. Felix Neck also has several kayak trips in the coming weeks -- see their program catalog for more information. MVTV Channel 13 is currently running a recording of geologist Rob Thieler's recent presentation sponsored by the Library Friends of Oak Bluffs and Felix Neck Wildlife Sanctuary. His talk introduces the fundamentals of climate change and sea level rise, and describes what the future may hold for both people and plovers in the coastal zone. Check their schedule for times (the next showing is 9:00 pm Wednesday), or watch online by clicking "watch now" on the schedule page. Each year, Americans discard around 96 billion pounds of edible food, and send it directly to landfills. Dive! explores "dumpster diving" in the back-alley receptacles of L.A.-area supermarkets and addresses vital questions about why such waste continues to occur while numerous overseas populations starve. 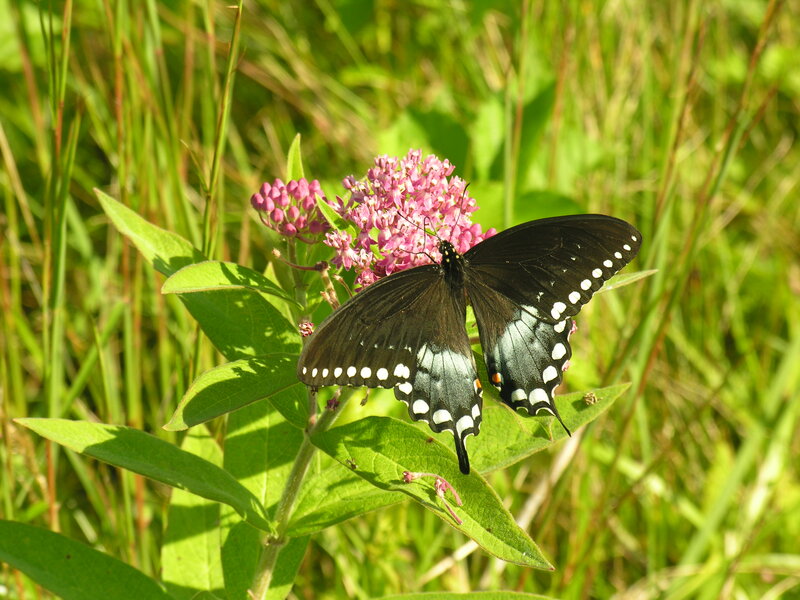 Swallowtail butterfly visiting Swamp Milkweed, just a few doors down from the Wakeman Center (click for full-size). Join us Tuesday, June 26, 5:00 pm at the Wakeman Conservation Center off of Lambert's Cove Road for the Annual Meeting of the Board and Membership. This year's meeting features a presentation by landscape designer and native plant specialist Kristin Henriksen. Kris will address lawn and landscape care that nurtures native plant species and protects natural resources like our coastal ponds. All are welcome. FREE. For more information, see our events page. The challenges of coping with rapid erosion are explored in a recent N.Y. Times article about Matunuck, Rhode Island, a village located on a south-facing shore similar to some of our most quickly-retreating beaches. Parts of the Matunuck shoreline have lost about 20 feet in a twelve-year period (or an average of 1.3 ft/yr, as per Wikipedia), causing considerable controversy over how to address the problem. These tough questions – and hard choices, in which someone always loses – are beginning to be raised on our island, but will only becomes more pressing in coming years. Do you protect an individual building from certain destruction at the cost of negative impacts down-current? How do you balance likelihood of risk with the breadth and magnitude of damage? And who gets to make that call? Had enough of exploding deer populations? You are not alone: Biology professor and animal behaviorist Dan Cristol describes in a recent editorial the impact of deer on songbirds and the broader devastation wrought upon forest flora and fauna. To a large extent, the increase in deer is due to laws and management techniques intended to promote their numbers for recreational hunting, a practice that seems unwise in light of the better-understood ecological impacts and greater awareness of tick-borne diseases, and possibly outdated, if the popularity of hunting – for sport or food – declines in future generations. As further evidence of the central importance of coastal waters and wetlands to climate change, and vice-versa, a recent international study found that coastal seagrass stores more carbon, per unit of land area, than forests. Seagrass beds were found to store up to 83,000 metric tons per square km (or, more impressive-sounding, 740,000 pounds per acre), and some have been holding that carbon for thousands of years.